Are you looking for a sport that is exciting, fast paced and skilled? Do you want to be able to watch this particular sport from all around the world? For you and many other liked minded people, motorcycle sport may well be of interest. There are so many different types of motorcycle sport too, that there's pretty much something for everyone. It doesn't necessarily involve racing or a timed speed event either. There are a range of other disciplines such as those that are a test of a rider's skill, rather than how fast they can ride. It's possible to broadly divide motorcycle sport into three categories. These three categories can then be further divided into a number of disciplines. Motorcycle road racing - also know as moto racing and bike racing taking place around a race track. Requires a number of competitors to take part in the race, either as a team or an individual. 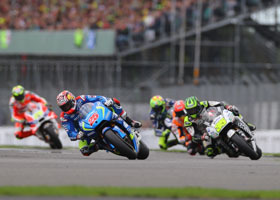 The top level event in this discipline is MotoGP racing. Motorcycle speedway - this is a type of racing, commonly known as 'speedway', that utilises a special type of machine. They have one gear and no brakes. Racing takes place around a circular track. Rally racing - that takes place on the highway. Competitors are required to visit a number of checkpoints during the race. The most famous of all is the Isle of Man TT. Auto race - this event is held in Japan. It's a motorcycle speedway competition. But is held on tarmac roads. In Japan it's a popular sport for gambling. Ice speedway - held on a track of ice using specially developed motorcycles. The race takes place around an oval-shaped race track, between 260 and 425 meters long. The bikes race in an anti-clockwise direction. Land speed records - this is an event not just for motorcycles. The aim is to cover a certain distance in the fastest time. Two runs have to be made in opposite directions in order to set a time. Endurance racing - Teams of two or four race over long distances. Drag racing - vehicles, including motorcycles, race along a straight track. The winner is the rider that completes the distance within the fastest time. Enduro - passing through a number of checkpoints, participants arrive at a certain time. Often held in thick-wooded terrain with large obstacles. Which obviously adds to the excitement for competitors as well as spectators. Endurocross - this event combines the best of trials, enduro and supercross and is also known as indoor enduro. Supercross - usually held in a specially built indoor dirt track, this is an event that has its roots in motocross. Supermoto - a race over different types of course: a flat track, a motocross track and a road course. Motorcycle trials - riders skill is tested over rocky terrain. Riders have to complete the course without putting their feet down. In the US it is known as observed trials. If a rider puts their feet on the ground they will receive penalty points. Hill climbing - it's pretty obvious what this is, a race uphill using dirt bikes. Motocross - held at specially built off-road circuits, participants have to negotiate various jumps and embankments. Freestyle motocross - competitors get to show off their acrobatic skills and ability on a motocross motorcycle. Points awarded are based on the difficulty of the manoeuvrers. Motorcycle gymkhana - competitors ride around cones on a paved area, against the clock. The winner is the one who completes the course in the fastest time. Participants are penalised if they hit a cone, put a foot down or go out of the designated area. Motoball - similar to football but the teams ride motorcycles. All except the goalkeeper. And the ball is much bigger. Tickets went on sale in November for the 2018 British Grand Prix. Silverstone will continue to host the event for the next three years. The British round will take place in Northamptonshire on August bank holiday week and it's hoped that champion Marc Marquez will be taking on rivals such as Valentino, Doviziosio, Lorenzo and Vinales. Cal Crutchlow is also hoping to return and get back on the podium on home soil. Besides tickets there is another option to enjoy the event. If you have a strong feeling that you know who will win the race or who will be at podium at the end, check some of the uk betting sites and test your luck and knowledge. The thrill is almost the same as being at the Silverstone! It has been decided by BSB bosses that a new Junior Supersport series will run alongside a series of support classes for next year. It will be replacing the KTM RC Cup and is aimed at riders between the age of 14 and 22. The regulations it will adopt come from the Supersport 300 World Championship. A number of different bikes will be eligible to race including Yamaha's YZF-R3, Honda's CBR500RR, KTM's RC390 and Kawasaki's new Ninja 400. Read more news at our dedicated page. 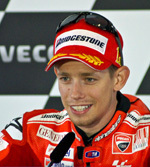 No rider before and since has been able to make the Ducati work for them like Casey Stoner. He may not be the highest title winner but is known for his ability to push any bike to its limits. His natural ability to adapt to any bike means he doesn't have to have the best bike in the world to win a race. The height if this riders career came during the peak of 500cc GP racing. While other riders were being flicked off their steeds he was recognized for his ability to stay in control while all about him were losing theirs. Riding a medium bike he managed to win 3 world titles, and there aren't many riders who can claim to have done that.